Enermax takes the wraps off its DreamBass Genie, a portable USB audio & amplifier solution. ENERMAX is proud to announce the launch of its first portable USB audio & amplifier, DreamBass Genie. With the latest audio-remix technology, it turns your music into solid bass enhancement, full surround sound as if you are in live concert, and lets you redefine the real-stereo experience. The perfect bass with wide-scale high definition audio output is always a dream for the audiophiles. Yet the conventional PC or NB is usually depressed by its dull, vague, compressed, and noisy sound output due to low cost audio-chip, entry-level audio remix software or limited PCB layout. ENERMAX DreamBass USB audio & amplifier is the remedy for music fanatics. With the latest VIA VT1620A chips, plus ENERMAX audio expert’s unique bass algorithm and delicated low-interference PCB layout technique, DreamBass Genie provides solid bass, crystal clear sound and perfect audio separation. It simply makes your PC audio output equivalent to high-end Hi-Fi stereo amplifier, and lets you touch every musical note and tone. DreamBass Genie is plug & play, and supports Windows, Mac OS, Linux or other operation systems. Just plug it into any available USB port on your PC/NB, DreamBass Genie will be activated and replace onboard audio chips. Furthermore, its dual-channel audio-input processor allows you to monitor the MIC recording sound via the headset simultaneously, a user-friendly feature for talking, singing, or voice recording application. For those who want to enjoy the DreamBass Genie without suitable headphone, we provide the DreamBass earphone combo set. This light-weight in-ear type earphone is special-tuned and works perfectly with DreamBass Genie. Together they will let you immerse into the surrounding vivid music as in live concert. 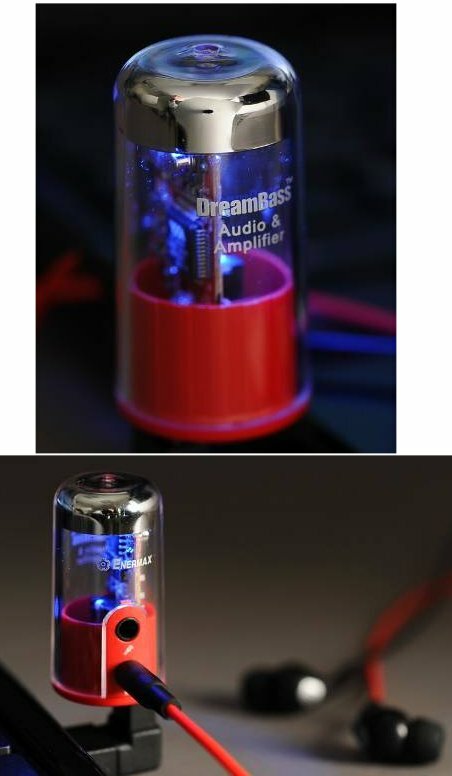 DreamBass Genie AP001 USB Audio & build-in Amplifier Spec. DreamBass AP001E combo set, Earphone Spec.